Woven roller shade fabrics are now the #1 selling commercial window treatments on the market. Woven shades are used extensively in most franchise resturaunts like; McDonald’s, Starbucks, Panara, Cracker Barrel etc. They have also replaced most mini and vertical blinds in new and remodeled office space. SheerWeave interior sun control fabrics provide the perfect balance of light, comfort and beauty, making them the ideal window covering solution for residential and commercial spaces alike. A sleek and functional alternative to ordinary window coverings, SheerWeave effortlessly and elegantly manages the sun’s harsh heat and blinding glare. SheerWeave filters and diffuses light while reducing glare and solar heat gain, conserving energy and helping to create a more comfortable environment. SheerWeave also helps reduce the fading of interior furnishings and flooring by protecting these surfaces from the sun’s harmful effects. And unlike many window treatments, SheerWeave allows excellent outward visibility – even when shades are lowered – to maintain optimal views. Phifer Suntex 80 and 90 fabric is available for exterior application. Used for sunrooms, decks, pergolas, roller shades, gazebos etc. Full and partial rolls available. OPENNESS – refers to the weave structure and gap size. When a fabric has a 5% openness that means there is 95% fabric yarns and 5% gap size. 15% would mean 85% yarn and 15% gap. The larger the openness (gap size), the better the visibility out. It also means more light (glare) and UV that enters. PRIVACY – Most SheerWeave (SW) shades offer daytime privacy. How well that you see out during the day is how well people can see in at night with interior lights on. True for any See Through Window Treatment. DARK VS LIGHT COLORS – Color has more to do with heat rejection than openness does. SheerWeave color options range from white and bone to darker charcoal and chestnut tones. These color designations go beyond aesthetics and color coordination with interior décor. Lighter color fabrics provide optimum heat reduction, reflect light and illuminate the interior. 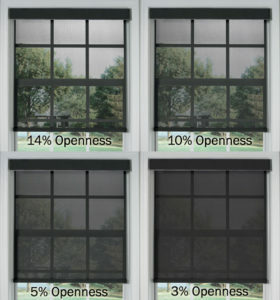 Darker fabrics provide a superb view to the outside and reduce glare, making them ideal for viewing computer and television screens. Darker colors can absorb the sun’s heat then re-radiate it into the room. COMPARE SHADING COEFICIENT (SC) – The lower the number, the more heat that is rejected. A shading coefficient of .38 means approximately 62% of the heat is rejected. Light colors perform better for temperature control. Dark colors usually offer better visibility out. The view is more defined. Dark colors work better for exterior shades. CLEANING – SheerWeave can be vacuumed for dust removal. Soap and water with a soft brush for soiled, then towel and/or air dry. WARRANTY – Limited lifetime warranty on shade components, 10 years on Phifer SheerWeave fabric (interior).